It's that time of the year again; on February 24th, artists and film technicians will all compete for the chance to win a gold statue of a little bald man. In other words, it's Oscar season, and this one has been one of the strangest in recent memory. From not having a host, to rumors of not televising some of the "lesser" awards to shortening the runtime, to an announcement — and immediate retraction — of a new "Best Popular Film" category, this season has already had a fair share of controversy. The nominations have left us with plenty to talk about as well. With critical darlings (Roma, The Favourite, BlackKklansman), more polarizing picks (Green Book, Vice), one film that hit with audiences but not critics (Bohemian Rhapsody), and two that hit with both (Black Panther, A Star is Born), the nominees this year are definitely a diverse lot. The question is which one will be the big winner? Every expert seems overly confident that Roma has it in the bag to win Best Picture, but I have my doubts. I would certainly love to see it win (it is the best film nominated by far), but it has some factors going against it. First, if it wins, it will be the only non-English speaking film to ever win the award. That could scare some voters away. Second, it is a Netflix release and the Academy still has some bias against the streaming service. Roma is a strong contender but with these factors, BlackKklansman or Green Book could steal the award out from under it. Despite being very different films, they both deal with a subject the Academy loves to reward and they're both more conventional stories than Roma's more episodic storyline. Roma is still the one to beat though. 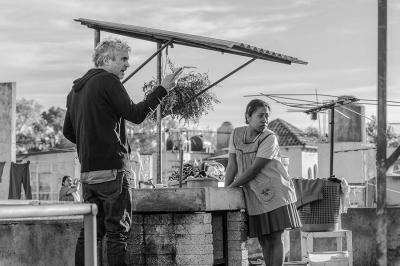 Roma's director, Alfonso Cuarón has a much better shot at winning Best Director. His work on the film was second-to-none and it could easily be his second win in just five years (the first for 2013's Gravity, besting Steve McQueen). The only competition I see in this one is from Spike Lee, who the Academy may choose to honor for his impressive body of work, and who — although given an Academy Honorary Award in 2015 — has yet to win a single Oscar. Plus, it would be the first time a black director has ever won the award … let that sink in for a moment. The Best Actor race is what's expected of the Academy: who can do the best impression of a famous person. It almost makes me want to vote for the only portrayal of a fictional character (Bradley Cooper from A Star is Born) out of spite. In my heart though, I know this is between Christian Bale and Rami Malek. I wasn't particularly impressed with either performance, but they mimicked the real people well enough, so the Academy will love them. Best Actress is Glenn Close's to lose (which she won't) for her role in The Wife, but in this case, all the nominees are worthy. I'm personally satisfied that Olivia Colman is getting so much love for her demented portrayal of Queen Anne in The Favourite, and I would love to see her be the dark horse winner. The seven-times-nominated Close will get her due instead. The Best Supporting Actor nominees are all worthy (except for Sam Rockwell's SNL-style impersonation of George W. Bush), but it really comes down to either Mahershala Ali in Green Book or Richard E. Grant in Can You Ever Forgive Me? I'd be happy with either winning. Best Supporting Actress is the biggest toss-up. All performances are good and all have significant momentum. In the end, I think it will go to Regina King's emotionally devastating performance in If Beale Street Could Talk. However, don't count out Amy Adams' performance as Lynne Cheney in Vice as a legit contender. Best Original Screenplay is between The Favourite (excellent) and Green Book (basic) and it could go either way at this point. I'd love to see Paul Schrader's magnificent First Reformed get it, but I know that's an uphill battle. Best Adapted Screenplay comes down to BlackKklansman and If Beale Street Could Talk. It would be great if Barry Jenkins won his second Oscar for his amazing Beale Street, but at this point, Lee's film is pretty much unstoppable.